A Georgia based brewery has switched from churning out beer to water to help victims of superstorm Sandy, MyFoxAtlanta reports. 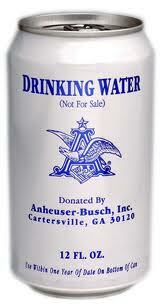 For a few days, beer will take a backseat at Anheuser-Busch, making water a top priority for those who need it. “It’s devastating. We have a lot of employees who have families who have been hurt personally by this,” said Rob Haas, general manager of the plant. The brewery plans on shipping 1 million cans of drinking water to New York and New Jersey from its Cartersville, Ga., brewery, MyFoxAtlanta reports.